Kaspersky Internet Security is a long-standing security program for the Windows operating system by Russian security firm Kaspersky. The program sits functionality-wise between the company's Anti-Virus and Total Security offerings. From a security point of view, it is offering more security features than Anti-Virus, and the same level of protective features as the more expensive Total Security product. In addition to offering all features of Kaspersky Anti-Virus, it ships with a firewall, host intrusion prevention system and other security features. You can download the latest version of Kaspersky Internet Security from the company website. It is provided as a free 30-day trial version that you can install on Windows systems for testing. 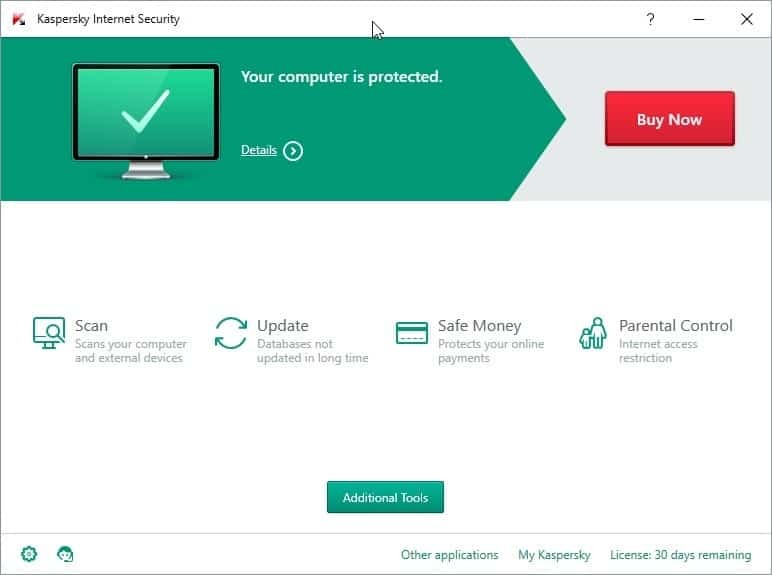 As far as a purchase of a license is concerned, you may want to buy Kaspersky Internet Security elsewhere as you will pay half or even less for it then. Amazon.com for instance lists the three device version of the program as a download for $26.94 (subject to change) currently while you'd pay $79.95 for the same version on Kaspersky's website. Program installation should not pose any problems, a reboot is not required after installation. The interface of Kaspersky Internet Security has not changed much throughout the years. In fact, the latest version still resembles the 2012 version of the program in many regards. That's however not necessarily a bad thing, considering that it helps users who upgrade as they don't need to spend time using the program. The program displays whether your PC is protected or not on start, and options to run scans, check for updates, use parental controls, and safe money. Several types of scans are supported by the application. You can run full or quick scans, scan external devices (there is a prompt whenever one gets connected), or run custom scans. The program is a bit limited when it comes to custom scans. There is for instance no option to save them to run them again at a later point in time, and custom scans cannot be scheduled on top of that. You may want to create a rescue disc on first run before you start running scans or make modifications to the application. It enables you to boot the PC using the Rescue Disc to remove malicious software from it which prevents the PC from booting or cannot be removed while Windows is running. The Tools menu links to the most recent version of the rescue disk on the Kaspersky website. It displays monitoring information such as current cpu, memory and disk utilization, network information, and a report history that lists blocked applications, neutralized threats and blocked network attacks. You can click on any of these for additional details. Application control for instance lists then the number of programs that are monitored, and how many of those are actively running. 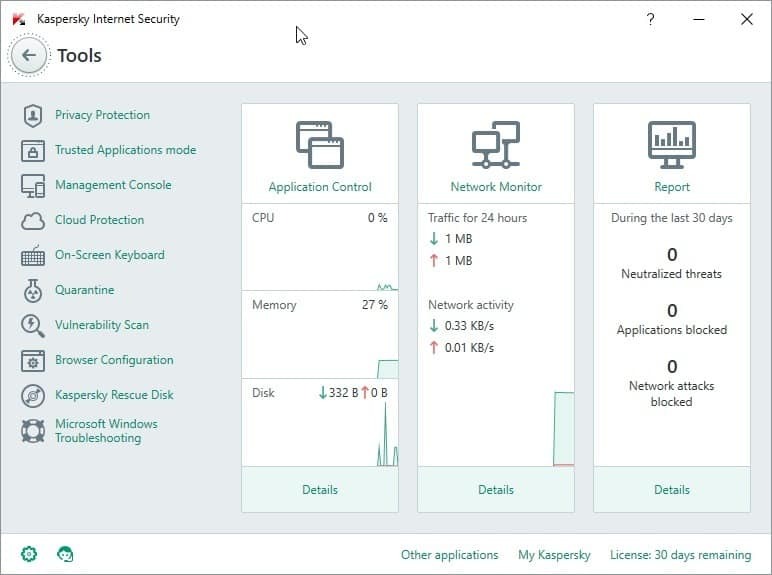 From there, you can go even deeper by displaying the application activity window which highlights all, running, and startup applications. Kaspersky displays information about each program there, for instance whether it is digitally signed and its popularity. You can move applications from one group, e.g. trusted, to another, e.g. low or high restricted, which define what a program can do on the system and what it cannot do. High restricted programs are blocked from accessing the webcam video stream for instance. You find plenty of other applications there as well. You can run a vulnerability scan for instance, which checks for known software and operating system vulnerabilities and suggests fixes for those found in a detailed report. Privacy Protection: configure private browsing and webcam access, and run the privacy cleaner tool to remove traces from the system. Trusted Applications mode: enable this mode to allow only trusted applications to run on the system. Kaspersky maintains a database of trusted applications that the program uses for that. Users can however add applications to the trust list so that they run on the system. 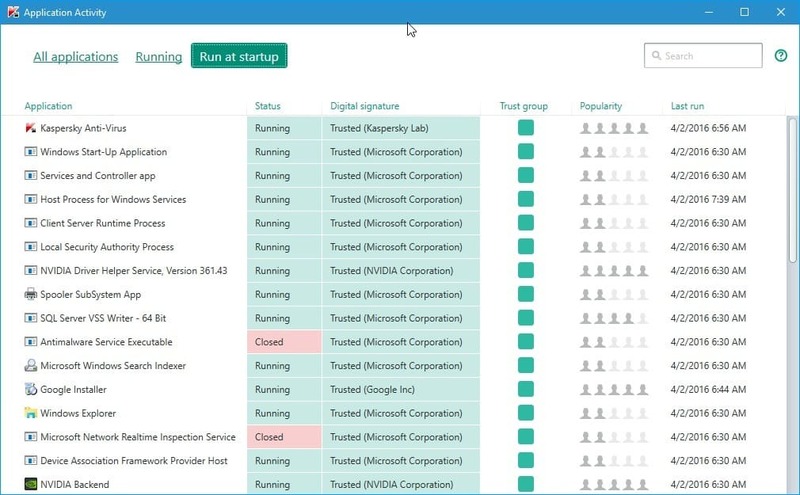 Management Console: is an online service that enables you to manage your devices remotely from the Kaspersky website. Cloud Protection: leverages information from Kaspersky users worldwide to provide faster and better protection against threats. On-Screen keyboard: adds an on-screen keyboard to the system, requires a restart. Quarantine: lists malicious files Kaspersky Internet Security blocked from attacking the system. Vulnerability Scan: scans the operating system and applications for vulnerabilities. Browser Configuration: performs a security analysis of installed web browsers, and enables you afterwards to resolve security or privacy related issues found. Kaspersky Rescue Disk: links to the Kaspersky website where the rescue disk can be downloaded from. Microsoft Windows Troubleshooting: scans the system for system settings that have been modified by malware activity, and proposes to restore them to their original values. The settings allow you to turn features on or off, and to configure them. The program gives you a lot of control over the features that it makes available. This goes as far as allowing you to disable the file anti-virus functionality. It is recommended to go through the settings on first start and disable any feature that you may not require, and to check out the configuration options for all others. For instance, if you don't run instant messengers, there is little need to keep the IM Anti-Virus component activated. Some components, like the System Changes Control feature, are not enabled by default. Another thing you can do here is disable the automatic mode that Kaspersky Internet Security ships with by default. The program performs recommended actions automatically by default. Great if you don't want to be bothered by prompts all the time, not so great if you prefer to be in full control. Backup, encryption and file shredder. Plus, online backup. How good is Kaspersky Internet Security? Kaspersky has received high ratings for its products in the past years. Internet Security got the product of the year award for instance over at AV Comparatives. Kaspersky Lab is this year’s Product of the Year, having received Advanced+ awards in all of the year’s tests. It also wins the Gold Award in the Malware Removal Test, and joint Gold in the RealWorld Protection and File Detection Tests. Additional wins this year are the Silver Award in the Proactive Protection Test, and joint Bronze in Performance. We liked the real-time progress displays in its refreshed user interface, and the extensive and excellent documentation. AV Test gave Kaspersky a 15 out of 15 rating. Kaspersky Internet Security is a long standing security program for Windows that receives high protection ratings year after year. The sheer functionality that it provides may overwhelm some users, especially since it may not always clear how one of the protective modules the program offers work. Windows users who don't need the extra features that Internet Security offers could consider getting the Anti-Virus version instead which lacks firewall and some other features but is usually cheaper because of it. Easy to use interface, and an automated mode that handles some decisions automatically. Excellent configuration options to turn features off or on, and to gain more control over the program. There is no option to customize the software during installation. Everything gets installed, and it is up to you to disable features that you don't need afterwards. The program lacks tooltips, but ships with a local help file that provides you with information about its modules and settings. Parental controls offer no real-time notifications or remote control options. I’ve also read Kaspersky bribe the AV testers so they consistently get the highest scores. Probably false but then I wouldn’t be surprised if it were true. Now that’s a must for every Corporation. Those who do not agree are either Tinfoil Hat or potential Terrorists. Kaspersky has good reviews, but for a reason: they get many malware before others. Check threatpost.com for their researches. IMHO, these AV do not have so much sense: by trusting every module from big Corp. they open your system to attacks. ADOBE FLASH and ORACLE JAVA are the biggest problems. then they recommend? not use any antivirus or some other specific? ‘ClamAV’ or “Common Sense 2016 Beta”. Yes, that claim was proved to be false. Not to mention that the initial claim didn’t have any evidence AT ALL. Why are you continuing to spread this rubbish around? What other rumours have you heard, Mr I-believe-everything-I-read-on-reddit-and-on-newssites? Your comment is so ridiculous I actually wouldn’t be surprised if it was written by someone working for a competitor, or by someone with an irrational vendetta against Russia and Russians. The latter is probably the case since you seem to believe everything you read and we are in the middle of Cold War 2. You can turn off the optional browser integration which a switch on the modules page, like Martin suggested. I guess that’s very difficult for someone in your state of mind. That module is enabled with your knowledge and consent and it’s right there in plain sight in the UI, Mr I-dont-read-contracts-before-agreeing-to-them-either. Turn it off like a normal person. “Install Pentoo” is clearly someone from 4chan’s technology board. It’s a common troll there in topics discussing Antivirus’ etc. to state that everyone should stop using Antiviruses and instead use ‘common sense 2016 edition’. I’m not surprised these trolls spill across to other sites, including this one. I found it slowed my boot time considerably. On my laptop browsing was noticably slower as was pretty well everyting else. Once it expired I installed another suite. But no looking back . That’d be the biggest annoyance here. I hate approach “we know what’s better for you”. Sadly, it’s common nowadays elsewhere. I ran Kaspersky on five PC, until Russia invaded Crimea. I am back using AVG. So… you’re racist now. “Racism is bad unless it’s against Russians” right? Screw you. Since when have Russians or even more so Crimeans been a race of people? I think you’ve mixed up peoples (biological) race with their (culture) ethnicity. Corky is right. Since when is a country, or a language, or an ethnicity a race? There are only four races: red, yellow, black & white. And most geneticists claim that red is actually an extension of yellow. Many who are mixed race usually claim one as being more predominant in their genes than others. Them not allowing a “custom install” is another good example of most computer-related companies gradually taking more and more control away from end users. I can’t imagine that a “custom install” option with a few check-boxes for optional components would have been all that hard to implement. At least you don’t have to have an internet account and be logged into it to even use the software as was reported with Bit Defender’s product reviewed yesterday. I’ll be passing on Kaspersky and Bit Defender at least for the time being, but thanks for reviewing them, Martin! Well, I’d argue that there is some merit to installing *everything* – most people don’t understand nor care about customization. They just want things to work. Which makes sense. Not that I personally like that. Speaking with just anecdotal evidence, Kaspersky is probably the best of the antivirus companies out there. I can’t tell you how many times I’ve found an article about a new malware threat discovered by Kaspersky.. Recently we learned that a particularly nasty malware has code telling it not to activate if Kaspersky AV is detected on the system. And last year there was a story about Kaspersky discovering state-created spyware on their own systems that was trying to discover what the Kaspersky team knew about that state’s spying activities. In other words, Kaspersky is at the very centre of the anti-malware fight, and the bad guys have noticed. Having said that, I don’t recommend people bother with anything beyond an antivirus program. A lot of those extra “features” in the high-end internet security suites are either not needed or are already in place on your computer. Anti-spam? Your email provider does that. Parental control? Windows has it. Anti-phishing? Well, if you want all your web activity to be monitored by a third party to scan for malicious sites, Firefox will do this for you via Google. Save your money, Windows users, and focus on real security: good web habits, trusted software, strong passwords, a simple firewall, a simple antivirus app, and a couple of security add-ons in Firefox. Done. “Who Do You Trust” & “Who Watches the Watchman”. 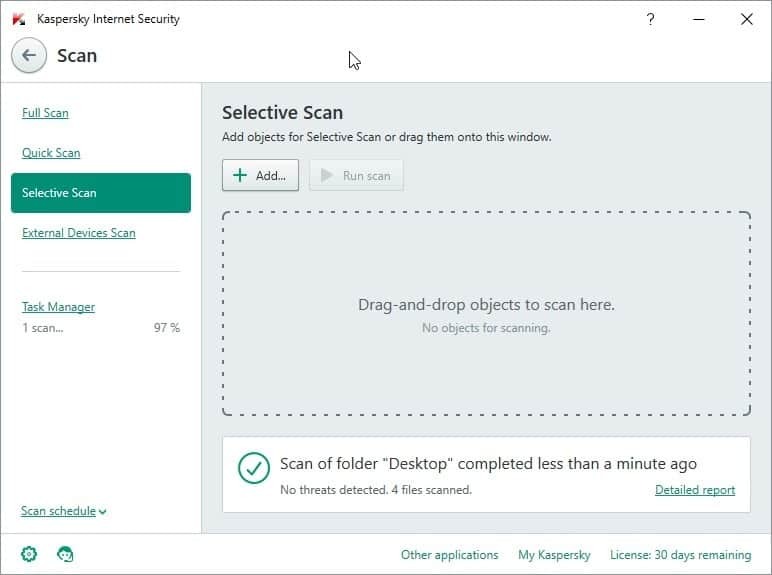 Kaspersky AV (and similar applications) are extremely intrusive— one can never be sure exactly what they are collecting from your PC or how they might be modifying your PC operation. Good AV software must look deeply into your PC. Cloud & Phone-Home communications improve efficiency and effectiveness. But enabling such capabilities always comes with indeterminate privacy/security risk. Your basic PC hardware & operating system also have such risk, but it is generally much lower and/or more readily detectable by a huge base of professional & personal PC users. Perhaps a reasonable compromise would be a portable version of Kaspersky (& similar AV) that never phoned-home… and uses a separate internet download & manual install of updates. Users could then choose the fully automatic deluxe version … or a more privacy friendly portable version. This can be said about any piece of installed/run software on your computer. Start with the OS. The only way to prevent “calling home” is to completely disconnect from Internet and never connect. Very good review Martin. Thanks. True, but since KIS 2013 when you update a software, Kaspersky doesn’t remember the name of old .exe files in the group you created and re-create the default name group and rules. Annoying. Then, if they re-organize windows context menu (colapse items and insert maybe shredder option as TS), implement with anti-ransomware (sincerely, how many protection software I’ve to install? Isn’t enough KIS, M-AM, Spyshelter…), and add an option to disable the windows ‘Don’t ask for the next 30 min’ too, it will be perfect for me. There’s no doubt that the free and integrated Windows Firewall is superior to what this product offers in its Internet Security suite. 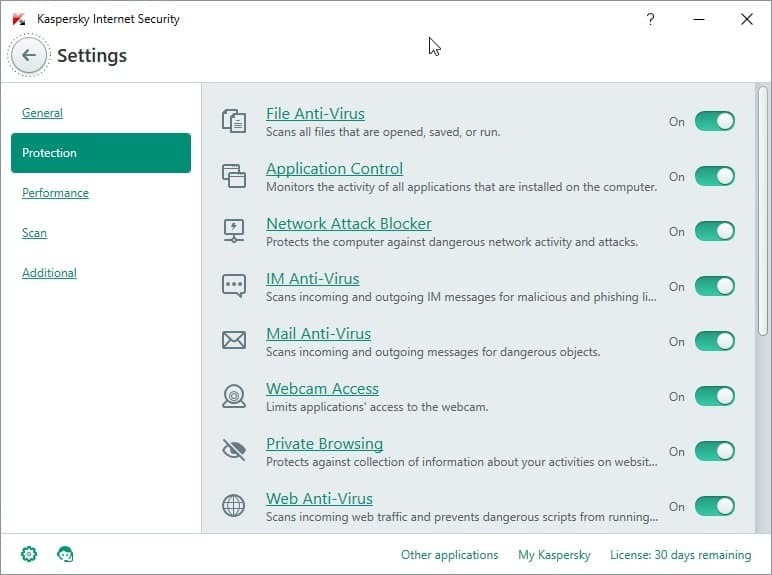 Kaspersky’s take on a software-firewall is the worst I have ever seen in terms of usability, at least for anyone who wants a software with some fine-grained setup options. That’s what I learned to my dismay, when I tried free trials of all those commercial security software suites, Kaspersky among them. Sure, it’s going to work well enough for a casual user, but how often does someone like that truly *need* a firewall anyway? More often than not, casual users are served well enough by a free anti-virus solution, because most of the internet security suite premium features only slow their computers down unnecessarily. In the rare exception when a software-firewall is desired anyway, then Kaspersky is doing everything right, since it seems to work on a reputation-based system that compares a computer’s programs with their own database. I just uninstalled Kaspersky yesterday from my friend and installed Avast. Kaspersky, even if you discounted the fact it is Russian company, installs ton of garbage that can not be removed unless you remove Kaspersky itself. Hopefully she will get some money back. I never recommend Kaspersky and I make sure that it is never on my friends computers. Russian software, developers are cooperating with the government. No thanks, i don’t trust Kaspersky software. Probably less so than most developers in other countries, I’d be more trusting of Russian developers and software companies than anything coming from America or the UK. Me too. What’s a foreign “enemy” government going to do with my info? Nothing. What could my own or “allied” government do with my data? No doubt they could do anything they want. They could even make up new data and pretend it’s mine if they wanted to. China and Russia are welcome to make the hardware and software I use. If I move to China or Russia, then I’ll buy Western stuff. It’s horses for courses. IMO slowest AV in market… and it’s not worth the price – better option is use defender / free av and SRP/AppLocker + admin account + standard account with UAC. Just defender + the money for a sandbox, close enough. Kaspersky just the best antivirus. even close to this . Look. Here is the problem. You don’t trust the Russian software makers? Fine. Do you trust all the Chinese hardware makers? Could there be all sorts of malware built into the firmware of your router\motherboard\phone just waiting to be activated. Buy American? It’s probably US design but built in China. If it is built in the US have the NSA got to the makers with all sorts of back doors? You can go mad worrying about it. Unless you want to build your own hardware from scratch (which you can’t) just buy what gets good reviews, hope for the best and don’t do anything illegal.